Back in the 80’s, when we still had a Shakespeare Theater down in Stratford, CT, there was a performance of Shakespeare’s Macbeth that was put on for all the high schools to come and see. Of all the plays, Macbeth seemed like it would be the most interesting, with witches and murder and blood, and big velvety Elizabethan costumes. I was excited – anything for a field trip and a day out of class. Until we got there. Some idiot had decided the best way for 1,500 rowdy high school kids to understand Shakespeare was to imagine it, with a play that had no scenery and no costumes – the entire set was draped in billowing soft blue nylon fabric, like the green-screens of modern movie-making, and the actors all wore tight-fitting outfits of the same blue, as if they’d just escaped from some monochromatic ballet. That was it. It was a total disaster. The audience was so bored and riled you couldn’t hear the dialogue for the catcalls. That is NOT the way to introduce children to Shakespeare. The good thing is, you don’t have to be a Shakespeare scholar to enjoy a good play. Whether you’ve had to suffer through drudging high school productions of Thornton Wilder’s Our Town or been dazzled on Broadway by Patrick Stewart and Ian McKellan performing Waiting for Godot, a play is not a bad thing. Perhaps your only exposure to theater has been dragging yourself through Oedipus or Antigone in school, not caring a flying duck about the role of the Chorus in Greek tragedy, just glad you scraped by and passed the test. The real tragedy of teaching plays as literature is that they are meant to be performed, not just read in a monotone like a stumbling seventh-grader who has no idea how to pronounce 15th century British comedies, let alone understand them. When performed, they come alive, like listening to a good movie on the television from the next room over. Even my five year old, with occasional explanations, could follow the movie version of Romeo and Juliet. So if you’re a theater lover, or just a student struggling to understand Ibsen, Cheshire Library is ready to help! Our newest precious addition is a 25-volume audiobook collection of 250 plays and dramatic adaptions by L.A. Theaterworks. You won’t just hear the play, you’ll feel it, as you were meant to. The plays aren’t just read to you, but fully performed by an all-star cast of more than 1,000 actors you are probably familiar with – George Clooney, Calista Flockhart, Dan Castellaneta, Mark Ruffalo, Richard Dreyfus, Jean Stapleton, John de Lancie (who also wrote one of the Doyle adaptions), and so many, many more. 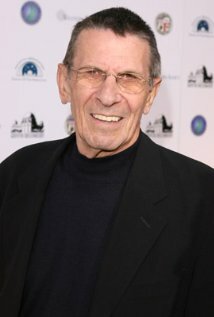 Leonard Nimoy performing War of the Worlds with fellow Star Trek actors? Yeah, that’s in there too. Neil Simon, Chekhov, O’Neill, Miller, Shakespeare, Sophocles – they’re all here, ready to keep you entertained for a solid year of performances. Listen to one or listen to them all – you’ll be glad you did.